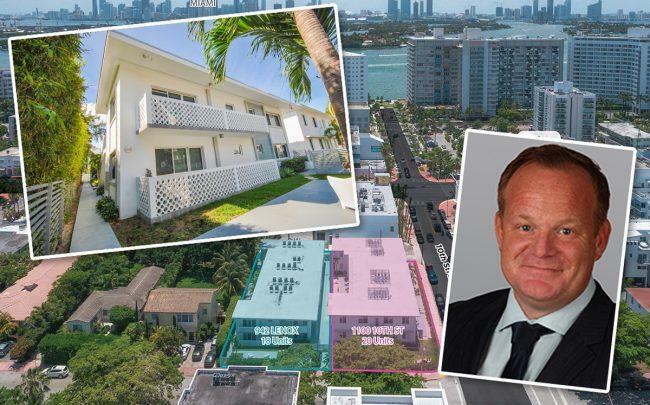 A portfolio of more than 100 apartment units in South Beach is hitting the market and is expected to sell for $27 million according to Cushman & Wakefield, The Real Deal has learned. Boardwalk Properties owns the six renovated properties at 1501 Michigan Avenue, 1100 10th Street, 942 Lenox Avenue, 1606 West Avenue, 1135 Eighth Street and 1521 Michigan Avenue, property records show. Cushman & Wakefield’s Calum Weaver, Perry Synanidis, Robert Given, Zachary Sackley and Troy Ballard are marketing the Lux South Beach portfolio, according to a release. Boardwalk Properties made headlines in 2016 when it paid $59 million for a 15-property, 240-unit portfolio of apartments, also in Miami Beach. Boardwalk is only looking to sell one of the buildings it acquired in 2016, a 12-unit, 7,200-square-foot building with apartments averaging 600 square feet. Boardwalk invested $7 million in capital improvements for the Lux South Beach portfolio, including installing impact windows and doors, new electrical, plumbing and HVAC systems, new kitchens, updated bathrooms and new washers and dryers. The properties, built between 1945 and 1969, are 98.1 percent occupied. Weaver said in the release that the units could be converted into condos by a new owner. Boardwalk Properties, a Miami Beach-based company owned by the Gober family trust and Adam Walker, owns multifamily buildings in South Beach, North Beach, Bay Harbor Islands, Fort Lauderdale and Davie. In December, it paid $119 million for a nearly 400-unit apartment complex in Davie.